Optical Sound Films collects the ongoing work and research of Guy Sherwin, one of the pre-eminent British film artists of the last 40 years in a unique artist’s book and DVD publication.Optical Sound Films collects the ongoing work and research of Guy Sherwin, one of the pre-eminent British film artists of the last 40 years in a unique artist’s book and DVD publication. Guy Sherwin studied painting at Chelsea School of Art in the 1960s before becoming closely associated with the British avant garde film movement centred on The London Film-makers Co-operative in the 1970s. His film works, often including serial forms and live performance, are characterized by an enduring concern with time and light as the fundamentals of cinema. Optical Sound Films explores in detail one of his particular and recurrent concerns, the synaesthesic relationship between sound and image manifest in the material of film sound. These investigations take Sherwin from physical manipulation of the very material of film through to live performances utilising multiple film projectors, all of which are explicated through drawings, diagrams, video documentation as well the films themselves. This publication provides a unique insight into conceptual and practical concerns for artists’ working with film as well as a detailed exploration of the processes and technology involved in its production and exhibition. 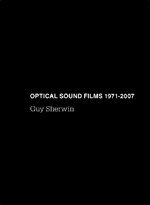 It also contains a DVD of Sherwin’s minimalist film works, documentation of a number of his performances and is completed with a new essay by Sebastiane Hegarty exploring synaethesia and sensory metaphor. Films: Phase Loop (1971), Sound Shapes (1972), Cycles 1(1972/1977), Newsprint (1972), At the Academy (1974), Soundtrack (1977), Musical Stairs (1977), Railings (1977), Night Train (1979), Interval (1974), Interval #2 (1974/2007), Notes (1979), Notes #2 (1979/2007), Optical Sound (2007), Spirals (1974), Cross Section #2 (1997/2007). Cycles #3 1972/2003 at La Sala Rossa Montreal. Newsprint #2 1972/2003 at Palais des Beaux Arts, Brussels. Mobius Loops 2007 at Palais des Beaux Arts Brussels. Sound Cuts 2007 at Site Gallery Sheffield.